My Mema was famous, famous for her chicken pies and her macaroni and cheese. Not her Almond Coffee Cake. I don't know if she ever even made coffee cake. So this isn't her recipe. Well, then why is this Mema's coffee cake? Because I used her cast iron skillet. You probably know those things are total heirlooms and so valuable to someone who likes to cook. A few years ago I planned to give Dave a cast iron skillet for his Christmas gift. But going to Target and buying one just isn't magical. Receiving one that belonged to one of the best comfort food cooks ever is. It is magical. My mom had Mema's pan and gave it to me to give to Dave. But really it's mine. Just like any other gift I've ever given him. Except the tickets to see Rush. He can totally own those. At the end of this summer, I decided to make a cake one night as a gift. There was no energy to shop for ingredients and bake the cake, so I had to find a recipe that only used the ingredients in my house. It's never been so worth it to run out of energy. I was so happy with the outcome. Most of us, especially if we are busy, are fond of those cheap, easy, creative recipes, such as pumpkin balls, turtles, and ice cream bread. But there is something satisfying and thoughtful and beautiful about a cake made with sugar and flour and butter and eggs....and not a processed food item in sight. 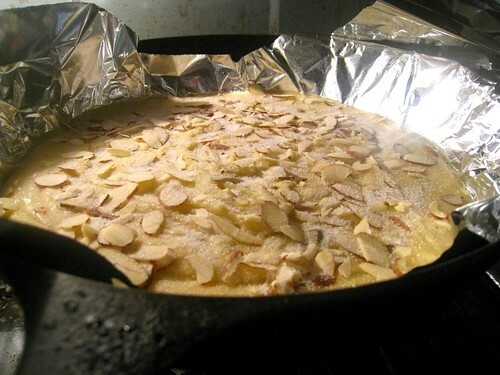 Line large cast iron skillet with aluminum foil; butter or spray with cooking spray. Melt butter and mix with sugar. Beat in eggs and flour, add extract and salt, mixing well. Pour into lined skillet. 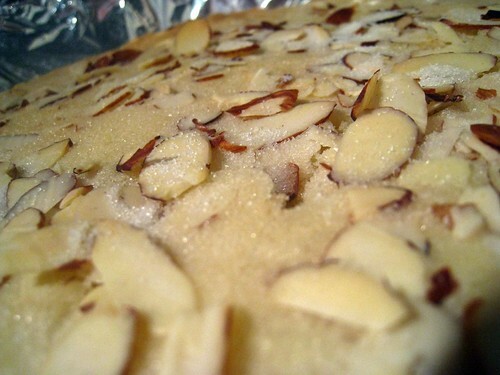 Sprinkle top with almonds and sugar. Bake at 350 for 30 minutes. I made 6 of these on our snow day for teacher gifts. 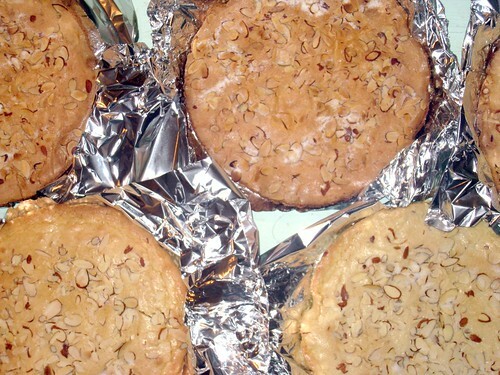 I lifted the cakes out of the pan with the aluminum foil and cool them on racks. I just added another sheet of aluminum foil to wrap and tied raffia around the whole thing. With a colorful tag it looks pretty festive. It's a good cake to make lots of, one after another. Just run the bottom of the skillet in cold water after you remove a cake. This will cool it down enough that it won't melt the next batch of dough you pour in. If you want another great flour-sugar-egg recipe, don't forget the sugar cookies. Best recipe for rolling and cutting and decorating. And no doubt the best cookie I've ever eaten. 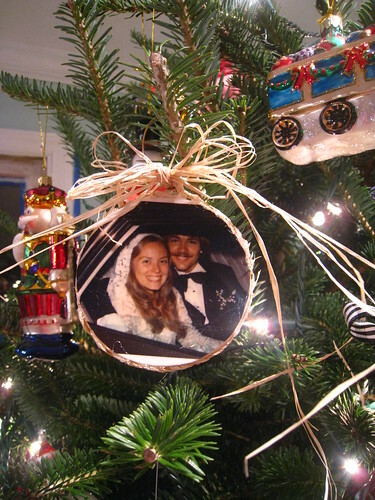 About 10 years ago, my most creative friend Jessica invited me over to make some Christmas ornaments. She told me to bring a photograph that I wanted to use. I really had no idea what photo to take, and I didn't have kids yet, so it took a little thought. An old photograph of my Mema and Papa is what I took, and it was the perfect choice. These are my dad's parents. 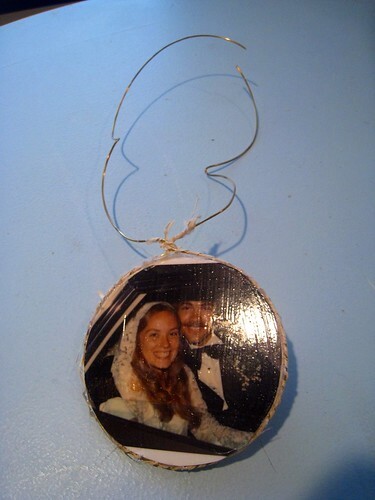 I made an ornament for my parents, my sister, and each of my dad's siblings. We used wooden disks from AC Moore, jewelry wire, raffia and some deconstructed earrings. 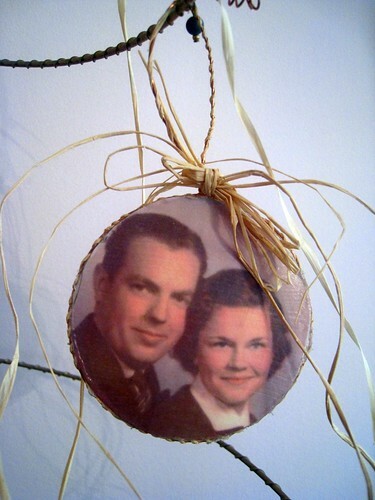 The next year I made them of my Mammaw and Granddaddy, and gave them to family members. Then I printed out a photo of my parents. 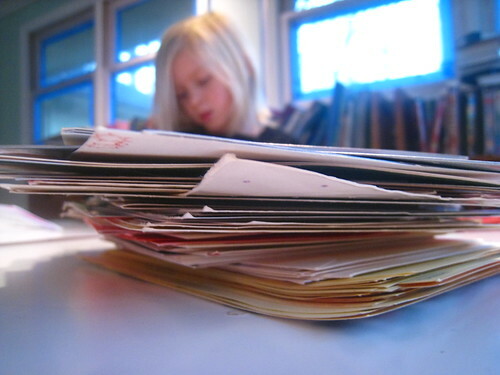 Those photos and supplies have been sitting in my desk drawer for several years. Too many kids, not enough time. 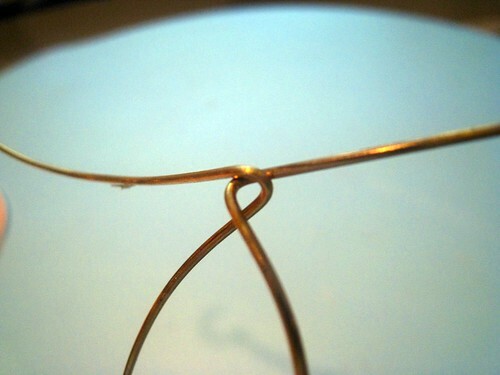 And, depending on the weight of your wire, you might need a pair of needle nose pliers to help bend and shape the wire. First, print your photos. 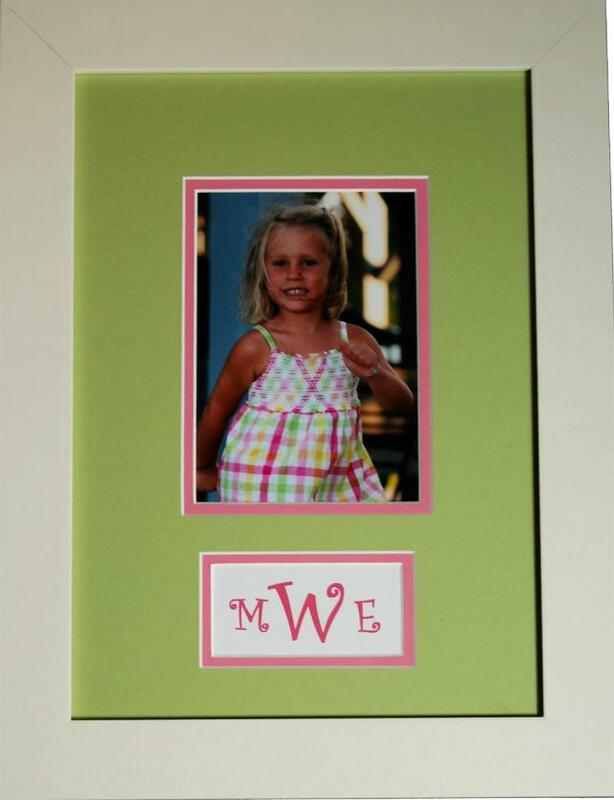 You can do a sheet of the photos if you are making them as gifts, or just one. And if you're making just one, you could use the original if you want. 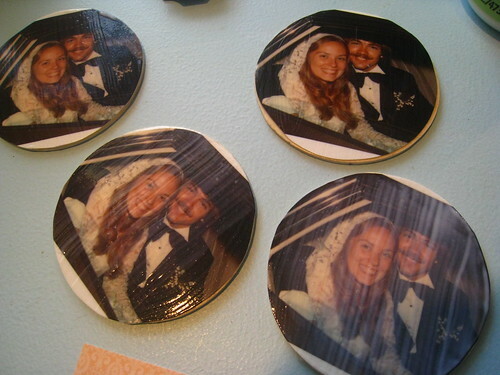 Trace the wooden disk onto each photo. 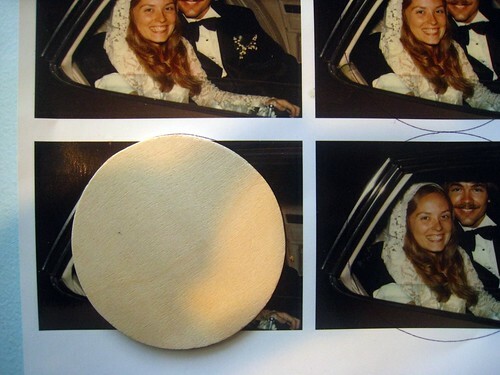 Cut the photos out just inside the line so that it will fit nicely onto the wooden disk. 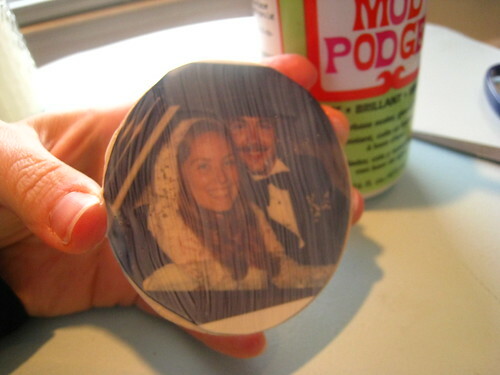 Paint the disk with Mod Podge. Stick the photo onto the disk. 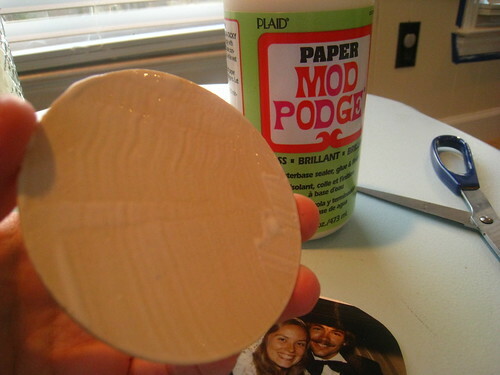 The Mod Podge will act as glue. 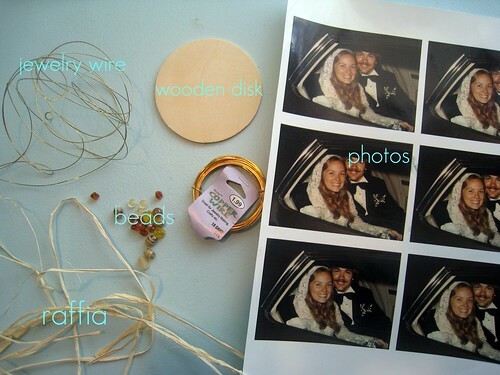 Then cover the photo with Mod Podge. Now take a break for some hot chocolate or spend some time wrapping gifts. When the Mod Podge is dry, you can continue. Or if you are in a hurry, lay a piece of wax paper on the counter, and lean the disks against something so that the disk is laying on it's edge, and neither side is touching a large surface. 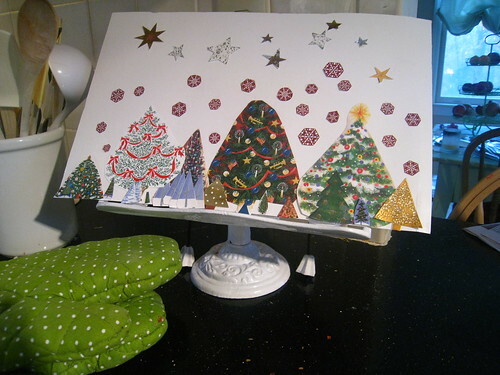 Cover the other side with Mod Podge and glue a piece of scrapbook paper to cover up the wood. Cover the scrapbook paper with Mod Podge just like you did on the photo side. Now really take a break. You want the disks to be completely dry before the next step. I waited overnight. 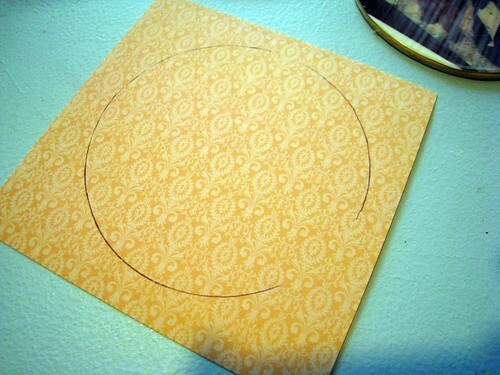 Unroll your wire and wrap it around your disk for a measurement. You want about 6-8 inches extending past the disk on either side for hanging. 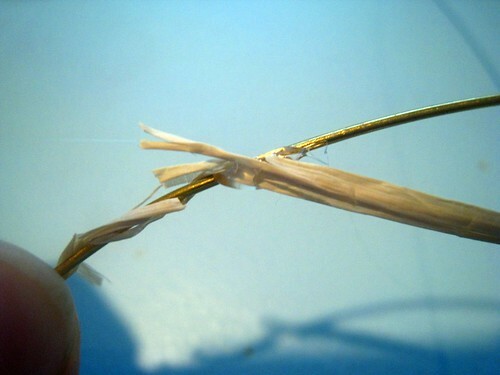 Use the sharp part of your needle nose pliers to cut the wire. 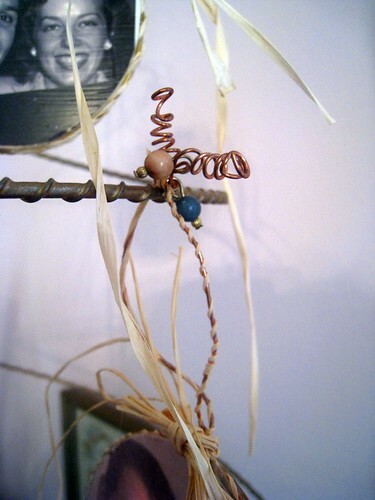 You want to wrap your raffia around your jewelry wire to decorate the edges. 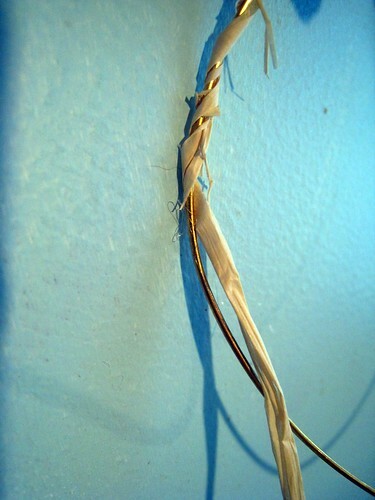 Put a bit of hot glue on the wire and stick your raffia in the glue. You want it secure enough that you can wrap it without it unraveling. Wrap it around enough of the wire that it will reach all the way around the disk. You could also wrap it around the entire length of wire. It's just a matter of preference. 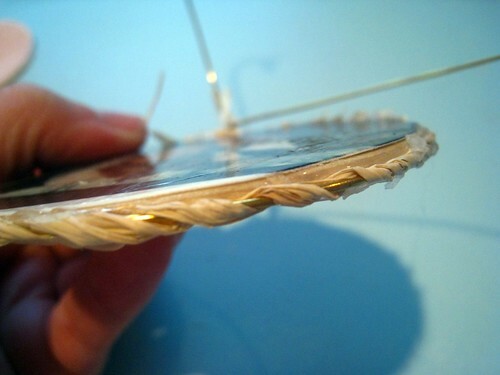 Use your hot glue to attach about an inch or two of the wire to the disk at a time. 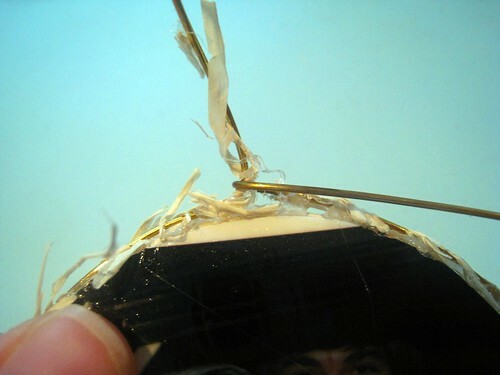 Hold the wire tightly to the disk while the glue cools. If you move too fast, the wire will try popping up as you move to the next section. Just be patient and do this slowly. 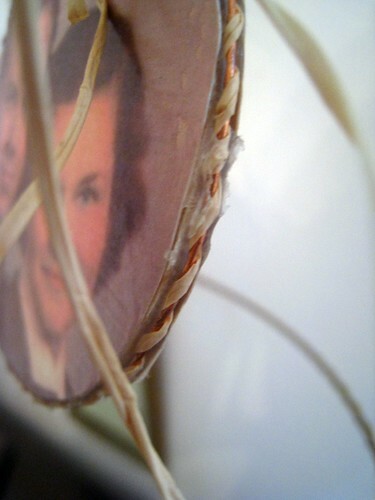 The raffia-wrapped wire should be stuck to the disk all the way around, meeting at the top. Wrap the wire around itself, securing it around the disk. This will be the beginning of your hanger. This is where you can attach beads or other embellishments. 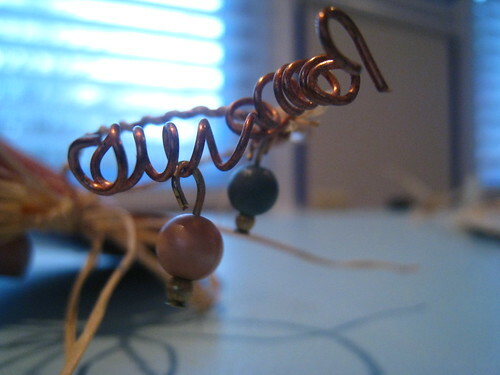 If you are using a pair of deconstructed earrings, they might already have wire loops. If so, just slide it onto the wire. You can also buy jewelry pieces from a craft store, already looped. 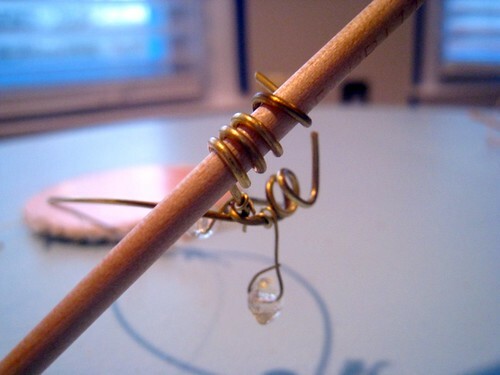 If you are just using beads, you will have to make wire loops to hang the beads from the ornament. 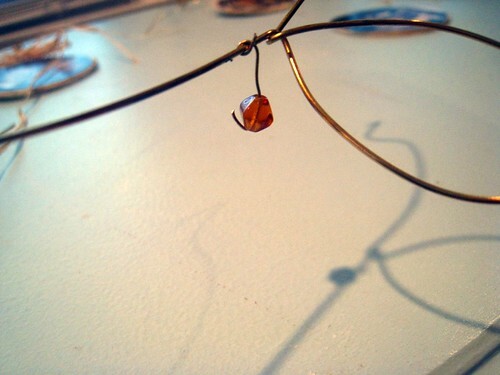 Just twist the wire around the bead to hook it on. You might need your pliers here to help bend. Sometimes the ends of the wire can poke your fingers and make it difficult to work with. Then just loop the end of the wire around the wire that is already attached to the ornament. The next step will keep the bead from sliding off the ornament. 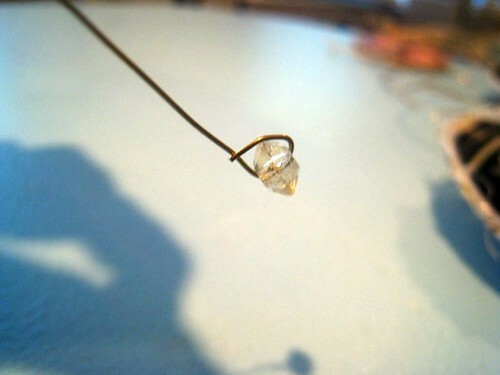 If you have thick wire, you will certainly need pliers for the next step. Find a long, thin, cylindrical object to wrap the remaining wire around. Preferably thinner than a pencil. I used a knitting needle. 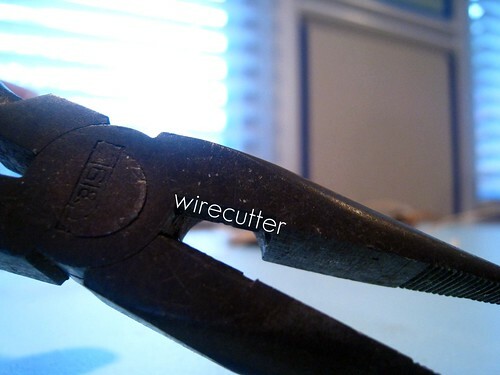 If the very ends are too tough to curl, just clip them off with your wire cutters. 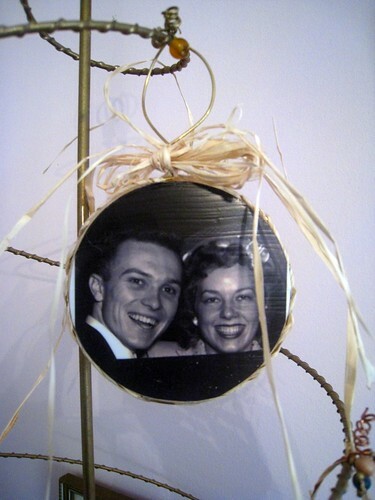 Shape your hanger so that it is somewhat of an oval, and embellish it with a rustic raffia bow. Hang on the tree for the season, or hang it somewhere all year round. I keep mine hanging on a wire tree in my dining room all the time, that also lets the curled wire and beads at the top stand out. These make great gifts, especially if you do them assembly-line style. 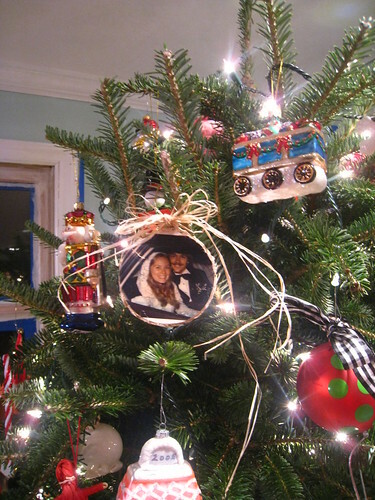 And they look great on the tree! 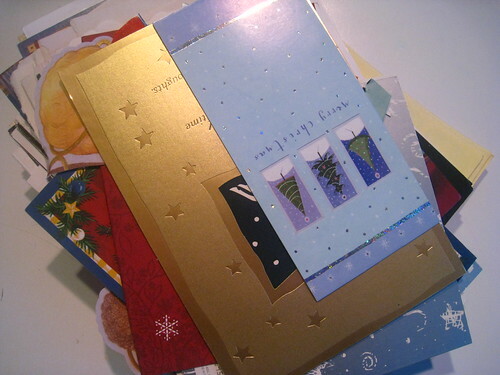 One year, my mom gave me a big bag full of old Christmas cards. I saved a few dozen and stuck them in the bag each year as well. I've had them in my classroom at school, just waiting to use them. But I could never come up with an idea that was worthwhile enough to pull them out for. I brought them home yesterday, and we started brainstorming. I told Anna Jane that she could cut out the pictures on the cards and we could punch holes in them and use them as ornaments on the tree. She cut out one, and it was big and cardboard-y and not really right to hang on a tree. 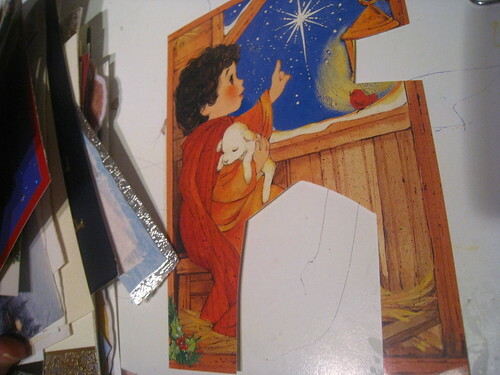 So, we decided to cut out lots of pictures from lots of cards and make a Christmas scene. She informed me that it was called a "collage," and as she is looking over my shoulder while I'm writing this, she told me that instead of calling it a Christmas scene, I should call it a collage. What an editor. 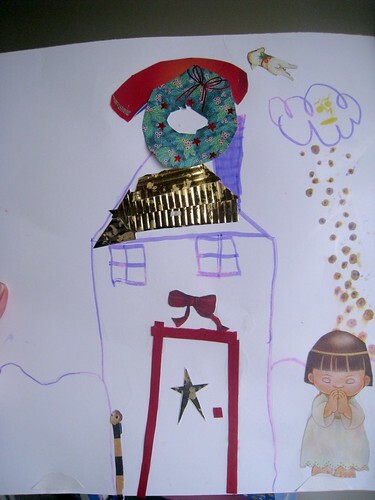 The first collage we made was a drawing of a house and yard, with cut out card embellishments. 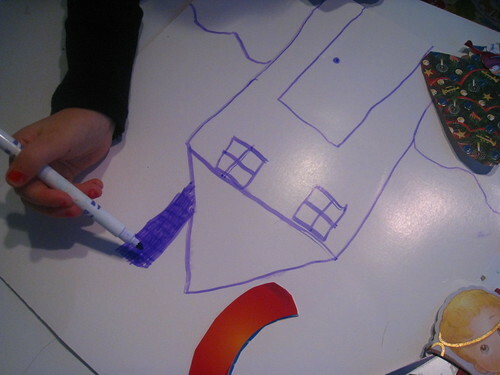 First she drew her house. 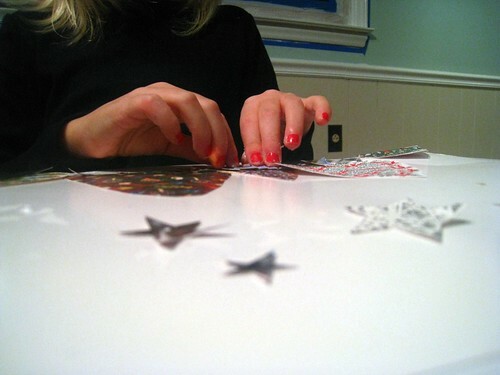 She cut out parts of the cards that she liked and glued them on in just the right places. The next collage we made was my favorite. We made a winter scene collage with just trees and stars and snow. For this one, we worked together. 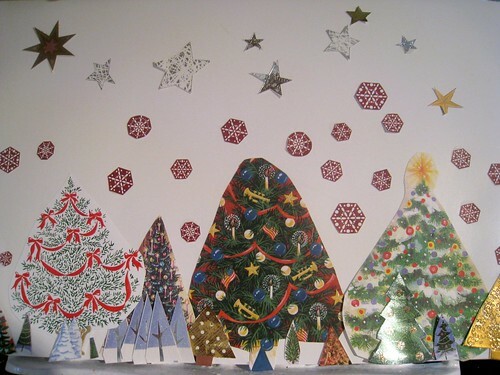 I cut out every tree and star and snowflake I could find, and she arranged them on the paper (we used posterboard). It took the hard work out of it for her and left her the energy to be creative. I can't wait to collect cards this year. I have a purpose for my collection! This doesn't have to be a kid's project...I imagine creative adults could make some really stunning scenes. 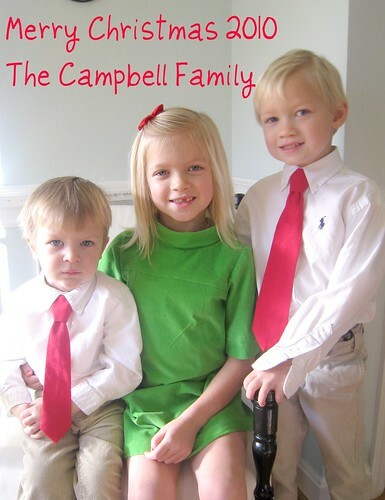 Think of adding some sheet music or tissue paper as background. The possibilities are endless, and mixed media can be really fun art. For Christmas last year, I gave Dave the first four seasons of How I Met Your Mother on DVD. We watched all of the episodes during Christmas break. If you've never watched episodes of a television show back to back, I highly recommend it. It's the way we watch Dexter also. This week's episode showed Neil Patrick Harris's character receiving a massive holiday bonus, and deciding to buy his friends all of his favorite things, a la Oprah's Favorite Things Episode. What fun it would be to give your friends and family everything you love? So I anticipated a snow day today and stayed up late to collect some photos of some gifts I would love to give. I tried to find a variety of prices, and gifts other than fabric, which was hard. Seems that Oprah always starts the epidsode out with a big ticket item, so here we go! 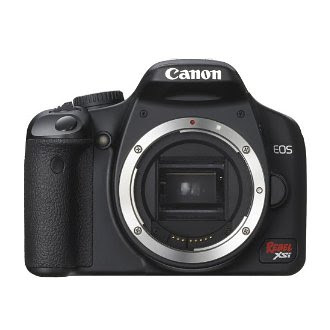 This camera has been on my list for a few years. 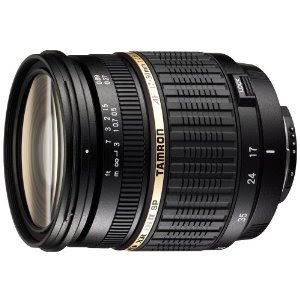 And really, a camera can't take photographs without a lens. 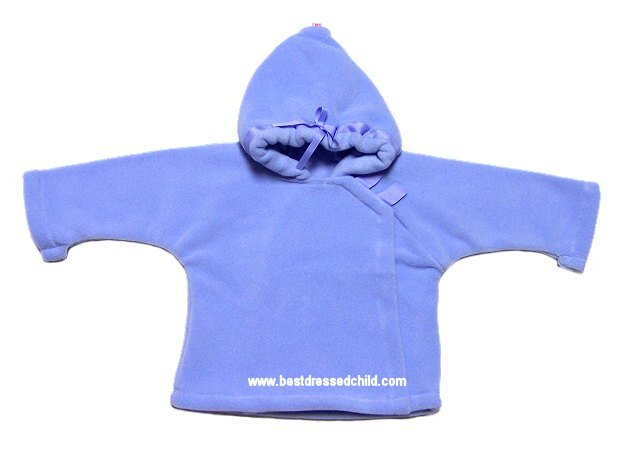 This is, hands down, the best jacket for little kids. It is warm and cozy and soft, and even more importantly, easy to put on. It's a Widgeon and you can find it here. 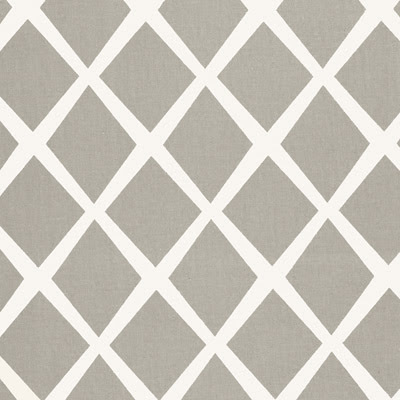 I love this Serena and Lily fabric for a living room chair. And at $50 a yard from here, good thing I'm just giving it away, because who in the world can afford it? Here is a little pedestal from the same source, at a bit of a lower price point. 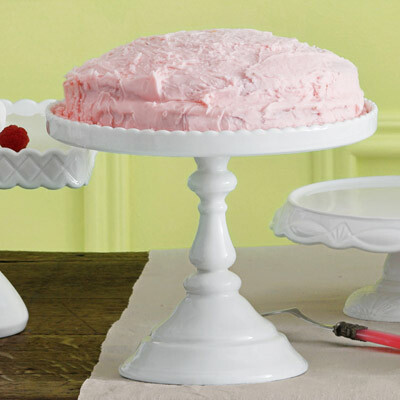 And who wants a cake stand without a cake to put on it? 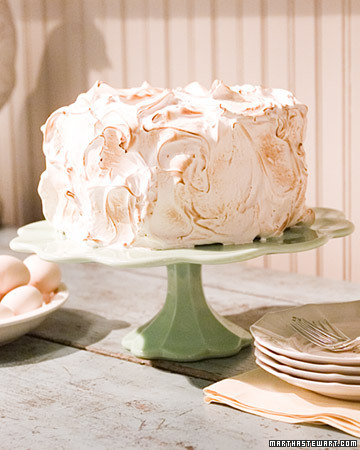 This is a Martha Stewart recipe, so I'll just make the cakes to include with the pedestal. 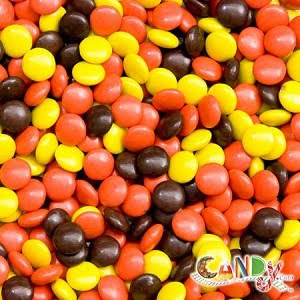 And I just love Reece's Pieces. I really hate to clean. Really. 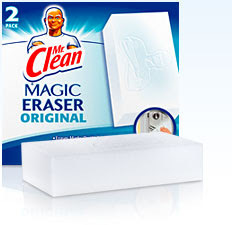 But these things clean everything. They are the best. 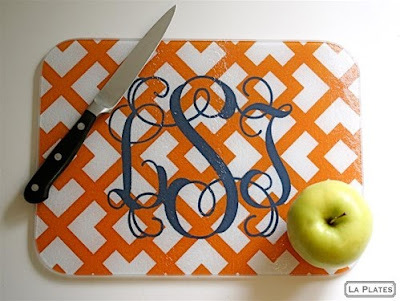 I love anything with a monogram on it. These cutting boards come in lots of patterns and colors. This is such a great gift. This website has lots of other options as well. 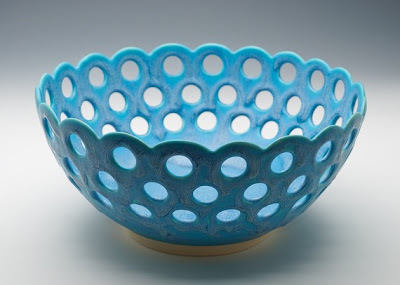 I saw this bowl on an etsy treasury one day and fell. in. love. I think she only makes these lace bowls as special orders, but since we are living in a Christmas Wonderland during this post, I'll just special order them for all of you! I bought three of these frames at our Junior League Holiday market this year. My friends Allison and Sarah personalize them for you as you wait. My frames are silver with white mats. They are so unique and very classy. 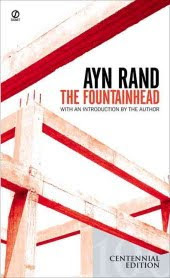 I read this book last year. I loved it. There's not much else to say. I loved it. 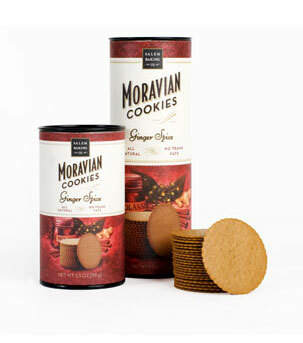 If you have any connection to Winston-Salem, then a Christmas without Moravian cookies is not really Christmas. I love Lilly. This cashmere wrap is almost $300. It will never hang in my closet or on my shoulders. But I will use my imaginary holiday bonus to buy one for each of you! My friend Lindsey always has these candles at her house. 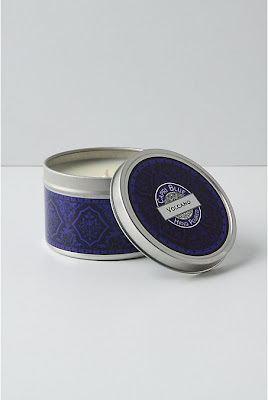 They are the best smelling candles ever. A very light and fresh scent. I could have gone on like this for pages and pages. Looking for things to buy for others was a lot more fun than looking for things to buy for myself. Keeps the greed away. I really appreciate manpower as a gift. My mom and dad scrubbed my front door this week. Mom is coming back tomorrow to clean my bathrooms. Dave put up new blinds in the playroom, and my Christmas wish is for him to help me start on my basement studio. These things are so valuable to me. It makes everyday life better, and the benefits last far beyond Christmas. Please enjoy all of these gifts I have picked out for you. 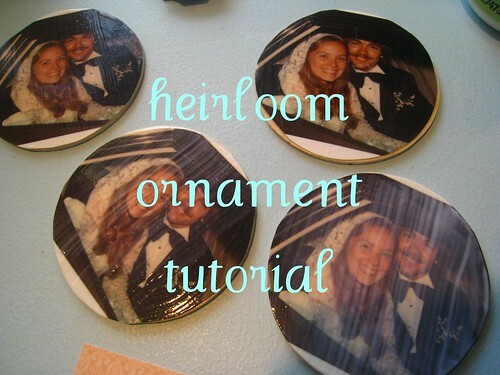 Another gift coming...an heirloom ornament tutorial!